. Property registration in foreign name or in a company name. The assistance of a trustful law firm is imperative. The Socia Lawyers Co., Ltd.
Real estate law is also an extremely delicate matter. Our law firm provides full assistance, consultancy with our expert highly specialised real estate lawyer, and information including conveyancing, transfer fees, tax, local regulations, assistance at the Land Office Departments all around Thailand guaranteed by our well known, trustful lawyer and law firm. A foreign national cannot, by law, purchase land in his own name in Thailand. A foreign national can legitimately purchase a building (as a house) in Thailand. He/she can resell it, rent it and bequeath it to his/her heirs. There is no time limit, but the seller should sign an agreement that the buyer will be allowed to resell etc. The value of a house (building) will be the one declared and registered at Land Office and it is distinguished from the value of the land. To register a building in the name of a foreign national the Land Office does not require (for now) a bank statement proving that the funds have been transferred from abroad. The transfer fees if the owner of the land has purchased at least 5 years before the sell of the building are: 2% of the declared value, 0,5 for stamps plus withholding tax that cannot be calculated without previously submit to Land Office all and any details. This information have been provided by the Head of the Pattaya's Land Department, Different Land Offices, located in different provinces, might apply different requirements and rules. Please note that legal issues are delicate and might present several aspects. Giving simple answers to what appear to be simple questions can be dangerously misleading, especially via text or email. The assistance of a qualified lawyer in Thailand is essential. 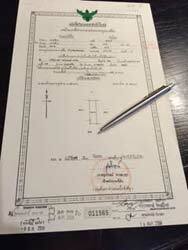 According to the Thai law, (Condominium Act) foreigners (both juristic persons and individuals) are allowed to purchase condominium units in Thailand, provided that the foreign ownership of the whole project does not exceed, in aggregate, 49% of the total area, and that the foreign buyer presents the requisite documents/evidence as requested by the pertinent Land Office. It is important to know that, the funds for the purchase of the condominium unit must be remitted into Thailand from abroad in a foreign currency. Furthermore, at the moment of arranging the transfer of the funds, the buyer shall specify the purpose of the remittance as “purchase of condominium unit/s”. The funds must be remitted by, or on behalf of, the person who will be registered as the new owner of the condominium unit. Please note that to execute the transfer and register the condominium unit under foreign name, the buyer must present a declaration from the bank for the amount corresponding to the total price declared for the sale at Land Office (TT3). The foreign natioonal whou purchases a condominium unit in Thailand will be allowed to remit abroad (tranfer) only the sum declared for the sale of the unit at the Land Office. We have interviewed Mr. Brian Presson, director of the “Owners Direct” a well-known real estate company in the Eastern Seaboard and Pattaya’s booming market. Mr. Presson was formerly a successful entrepreneur in the U.S.
Mr. Presson what do you think of the current real estate market conditions in Pattaya and its surrounding areas. Well, first of all I would deem the current market situation as extremely volatile. The construction is relentless and furthermore, the developers are continuously increasing prices. Last year we recommended our investors buy pre-construction. We negotiate the best price from the developer and we were able to successfully re-sell providing our clients a profit on all 32 investment. What do you mean “on all 32 investment? For the investors, our company purchased 32 pre-construction condos and re-sold all 32 units at a profit. So you still recommend buying pre-constructions? No. Currently we recommend buying the distressed seller-market and also the re-sell market. pre-construction or “off plan” and that are unable to continue making their payments. Also, we are finding great values in the re-sell market. There is a lot of inventory in the re-sell market and re-sells are much harder to sell! for two simple reasons: first, developers have huge advertising budgets. Secondly, they offer good payments terms. On the contrary, for the private re-seller it is very difficult to be found in such a huge market, and most can’t offer good payment terms. They want their money all up front. This gives a potential buyer a good opportunity to buy at a much lower price. As they say the first secret to sell well…is to buy well. So, Mr. Presson, what would be, in your opinion the best strategy for a seller that wants to re-sell his/her property? First, try listing the property with several agents. MLS (multiple listing service) doesn’t exist in Thailand. If you list your property with a single agent the other agents with potential buyers will not know about your property. Next, be flexible. Consider self financing (owner financing). Many foreigners are looking for financing for various reasons, including the new laws regulating the export of capitals out of their countries that do not allow easy money transfers. I usually recommend thirty per cent down and eight per cent interest over five years, but this can adjusted based on the seller’s and buyer’s needs. Yes absolutely so for investors. For individual buyers it is different. They usually buy for self occupancy. It is always a good investment “per se” to buy a place that your heart desires. Furthermore, developers still offer a good product at a reasonable price and construction standards are getting better and better. However, for investors looking for re-sell profit or rental return we recommend the re-sell or the stressed seller-market. Finally Mr. Presson, what is, in your opinion, the prospective of Pattaya’s real estate market? Long term I feel confident that the market will continue to grow despite the short-term inventory glut. Pattaya is growing very fast and also the opening of the Asian Market will surely attract more Asians investors. Also, compared to Bangkok and other Asian cities such as Singapore, Hong Kong, Tokio and Kuala Lumpur, Pattaya is still a great value. 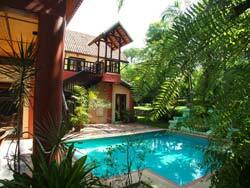 Pattaya is a prospering beach resort and an excellent place to visit or live. Pattay has a unique international flavor and an unparalleled entertainment venue. We can call Pattaya the Miami of Asia!